The better the people. The better the work. At S2 we recognize that we are only the sum of our parts - we look for talented, inspired individuals who bring energy and passion to our culture along with a collaborative spirit to our work. We aspire to cultivating a fun and creative work environment that encourages creativity, innovation and teamwork. 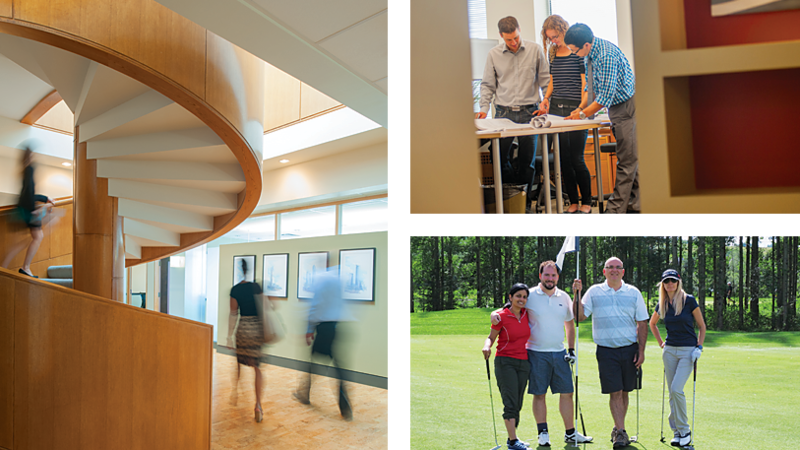 These are just some of the words our employees use to describe their environment and work life at S2. The culture at S2 is built around a passion for great design and superior client service. That philosophy is shared by everyone who works here. Empowerment and inclusion is paramount to great design, consequently, we encourage and promote both individuality and teamwork. S2 offers the chance to work (and play), in an engaging team environment, to work on exciting, innovative projects and to be a part of something bigger. At S2 you’ll fine tune your skills and cultivate your expertise while being given the opportunity to pursue your professional goals. Our people are integral to our success. We offer valuable benefits and are committed to providing our opportunities, with excellent professional and personal benefits which in turn promote professional growth, wellness and work/life balance. S2 days for time to spend with family during the holiday season. The S2PSP is a profit sharing program open to all employees. This program is financially beneficial to both the employee as well as the firm as a whole and promotes loyalty and long-term commitment. In addition to industry and provincial holiday standards, S2 provides additional ‘S2 Days’ throughout the year. This provides employees with additional paid time off around the long weekends as well as during the Christmas Season.